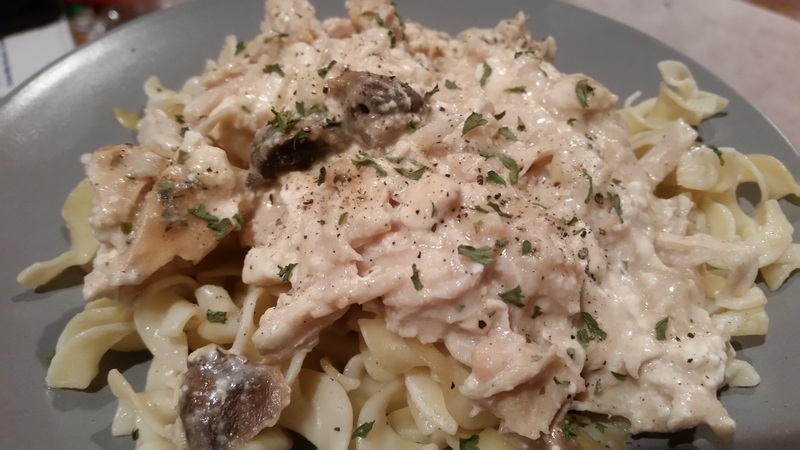 Slow Cooker Chicken Stroganoff (with no canned soup) – What's for Dinner Moms? Tuesdays and Thursdays are my slow cooker days. These are the days I depend on my favorite small appliance in my house, my slow cooker. If I don’t make a casserole for the first person home to pop in the oven you can bet dinner is cooking in my slow cooker. My family loves mushrooms. Me, not so much. I made this for a day I knew I would be one of the last people home and everyone before me would have dug out most of the mushrooms. You can still see a few on my plate but I used 8 oz of fresh chopped mushrooms in the dish so it started with plenty. It is just everyone kept eating them. As I noted before this was a good dish for me to be able to leave cooking. The sauce was creamy and the chicken easily shredded after 8 hours on low. If you prefer your chicken cut rather than shredded cut down on the cooking time and cube the chicken before cooking it. I sometimes prefer cubed chicken to shredded chicken. Place chicken, mushrooms, and onions in bowl of slow cooker. Top with cream cheese and ranch dressing mix. In a medium sauce pan over medium heat melt the butter. Once butter is melted sprinkle with the flour. Stir well for 1-2 minutes until thick paste forms and starts to brown slightly. Add half and half in a slow stream while stirring constantly. Stir for 3-6 minutes until mixture is thick. Pour over chicken. Cover and cook for 6-8 hours on low. Shred if desired or cubed. Thank ypu so very much, Lynn! I’ve been very busy lately. Sorry, haven’t been around in a while. Guess what? I’m not only starving, but I love mushrooms, especially Portabello. Thanks for another great meal.